I very much enjoyed my trip to meet the fine folk of Frome FM today. We even got lucky with the weather: a bright, sunny morning; too warm to be called ‘crisp’, even though we are now very much into autumn. It was fascinating to see the technology of broadcasting. We have all seen images of studios on TV and in movies but, as laypeople, most of us never get chance to be up-close and personal with all that exotic equipment. To those who are surrounded by that gear all the time, it all no doubt makes perfect sense, but to me, as a first-timer, the array of dials, lights, buttons, sliders and knobs seemed quite overwhelming, and I'd have been no wiser gazing at the controls of a jumbo jet. On the other hand, there was something quite comforting about the studio's acoustics. No doubt, that is about sending out the optimum sound quality into the ether, but I dare say it helps to be in such a calming atmosphere when facing down that mighty control panel for the first time. 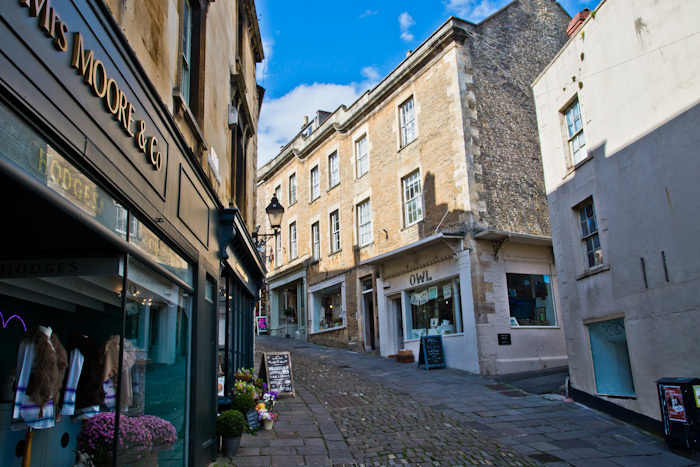 I didn’t have my camera with me - maybe that’s one for another day - so I’ll attach a Frome street photograph from last week’s shoot, to complete the blog, and say thanks to Frome FM for the friendly welcome, for showing me round, and for the very fine tea and shortbread. See you soon. If you’d like to check the station out, dear reader, it’s on 96.6 FM. It’s available via the internet too – they have listeners as far away as Australia and the Falklands, by that means – but I’m not sure how to find it. No doubt someone will clue me in.